Being a female myself, I find it quite dificult to overlook the hard working ladies of cartoon crime. It’s too easy for these chicks to get lost in the silhouette of all of the bad guys, but bad girls are worthy of accolades too! Whether they justly earned the status of Super Villains or just villains is arguable in some cases. However, they are just as malevolent and toil just as hard towards chaos and turmoil as their male equivalents. All they want is personal gain without any conscience, coupled with a sense of style and presentation and that’s the heart of female villainry. 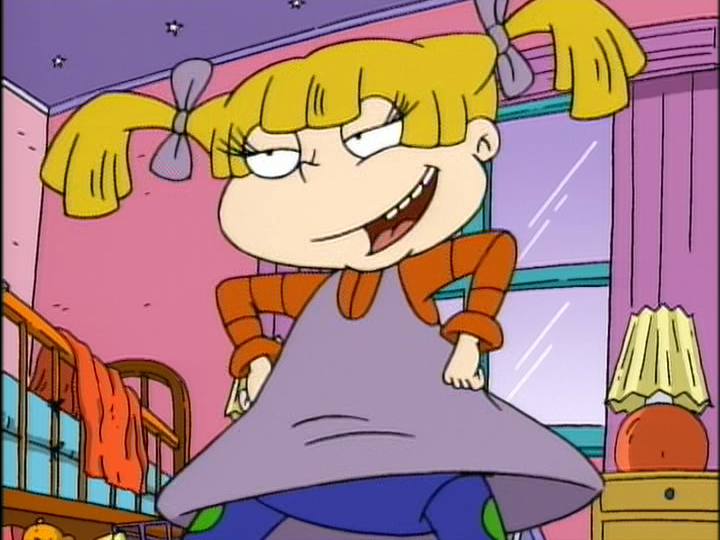 Angelica is the cousin to main Rugrat Tommy Pickles. Her mother is a dominating business woman who knows what she wants and accepts no excuses for not getting it. She wants everything for her daughter as well, so Angelica has developed the nasty little selfish streak you see in such spoiled kids. But she’s not just spoiled, she’s evil. Sure, she’s never pulled a heist, but I think at this stage in her life tricking Chucky into thinking swallowing a seed will cause his demise is evil enough for qualification. You’ve got to allow for her young age. Age matters more than scope at this point. So Angelica’s evil doesn’t span much beyond throwing mud, but have your heard some of the lies this girl can spin? She’s viscious! She’s a Maleficent in the making. 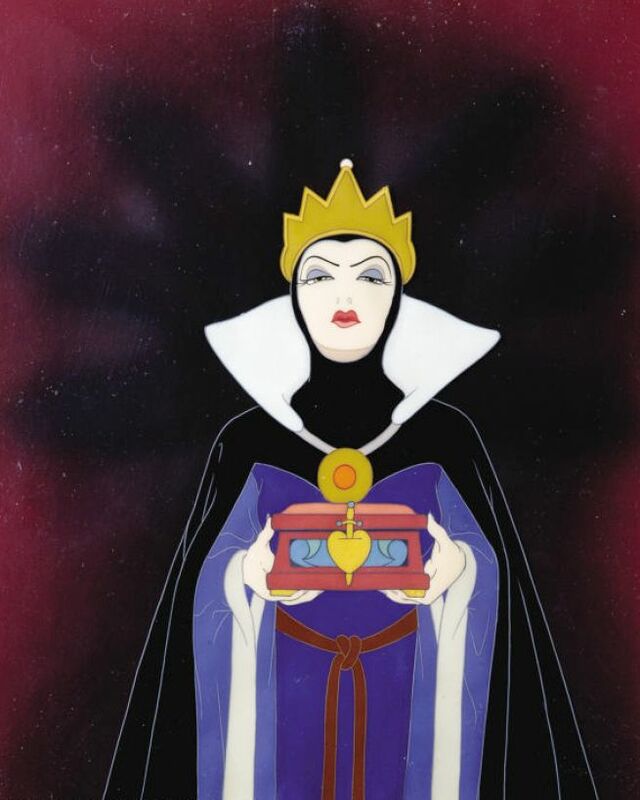 When “the fairest of them all” reaches an age where her radiance is fading, she plots to have her stepdaughter Snow White killed and demands that she have her heart to feed on. She even uses witchcraft to transform into an old lady which allows her to give a poisoned apple to a naive Snow White. “Must get moose and squirrel!” You can hear her voice in your mind as clearly as the first time you heard her utter those words. Bearing an uncanny resemblance to Sonny and Cher, Boris and Natasha worked with a partnership that definitely relied more on the female half than the male half would have ever admitted to. Most of their failure to capture moose and squirrel were due to Boris’oversights, not Natasha’s. I wonder sometimes if Natasha ever knew or cared why they had to get moose and squirrel, or whether she just carried out schemes with evil the single-mindedness inherent in the classic Super Villain. She was unrelenting and persistent, a true shining example of her kind. 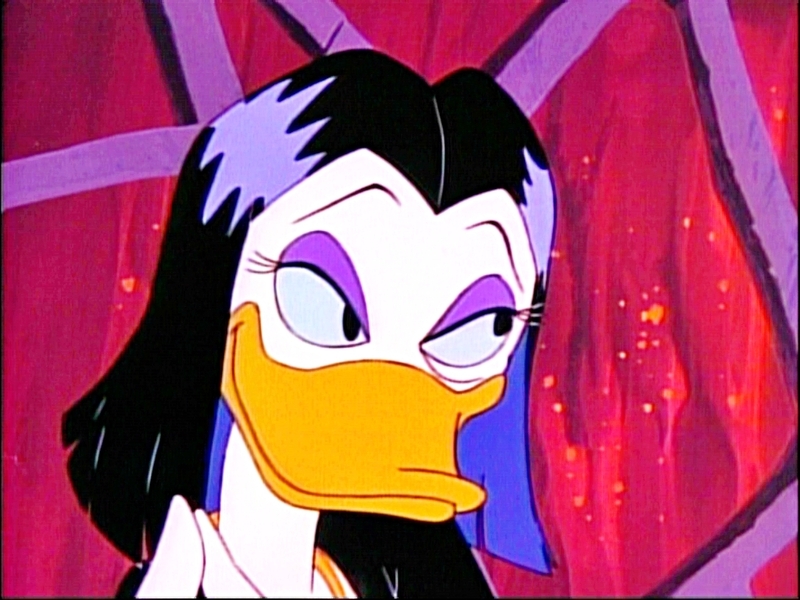 Magica De Spell (played by the best voice actress ever, Tress MacNiel) is an Elvira-esque sorceress who comes from the “eye of newt, wing of bat” school of magic. She was doing just fine, using her magic for chaos and ill-conceived bids for power, when suddenly she becomes aware that there is this fellow named Scrooge McDuck. She hears that this fellow attributes his good fortune in aquiring wealth to the very first coin he ever received, his Number One Dime. Of course, Magica is sure a talisman of that magnitude can only increase her power and make her invinceable. Silly or not, she belongs in this category. Her quest for the Number One Dime was as passionate and vague as Gargamel’s quest to capture a smurf. Did she ever just hire goons to kidnap Huey Duey and Louie and demand the Dime as ransom? Of course not, Super Villains never do anything that obvious. Instead she tried silly Super Villainous schemes, the best of which being the time she disguised herself as Helen of Troy in an attempt to capture the Magic Harp (and of course the Dime). Harley Quinn!! surely she is better angelica? !